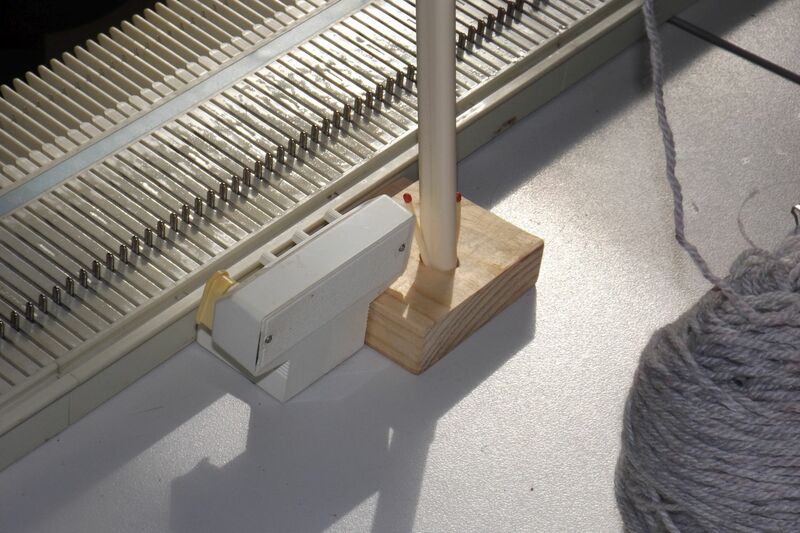 David converted a Yarn Holder into a Tension Rod Stand using a small piece of wood. 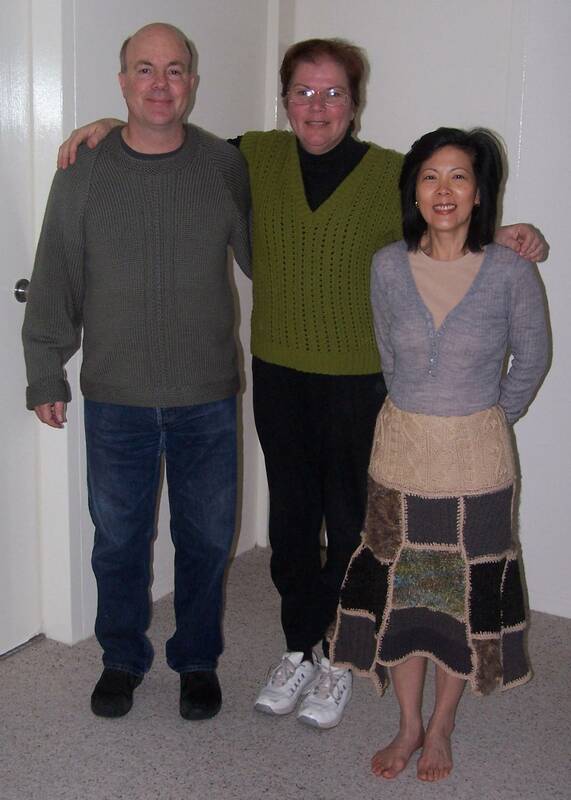 Mei's hand knitted patchwork skirt is from Vogue Knitting. Shane's jumper is an original design by Mei knitted partly by machine and partly by hand. 2002 Hot off the machine! 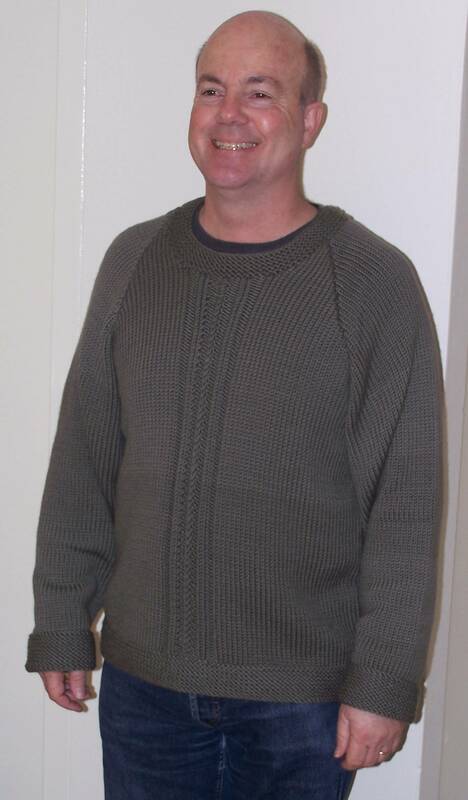 This is a fisherman's rib jumper in handspun, made on my 9mm bulky. 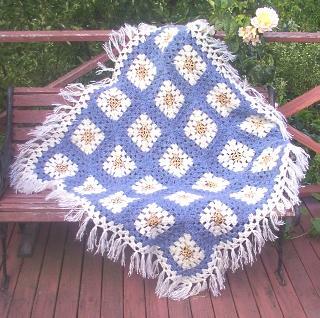 Crochet rug in mohair with gold lurex centres. This rug matches the colour scheme in my daughter's room. I imagine her wrapping herself in this rug while she studies. 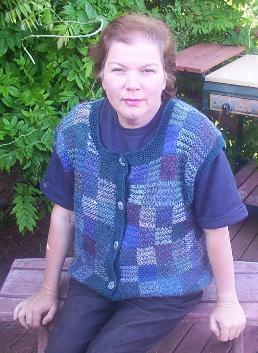 The vest is in tweed stitch squares, and like the one I made for myself below, is from Sally Melville's book "Styles". The bands and the back are done on the knitting machine while the fronts are done by hand. A quick way to get things done. 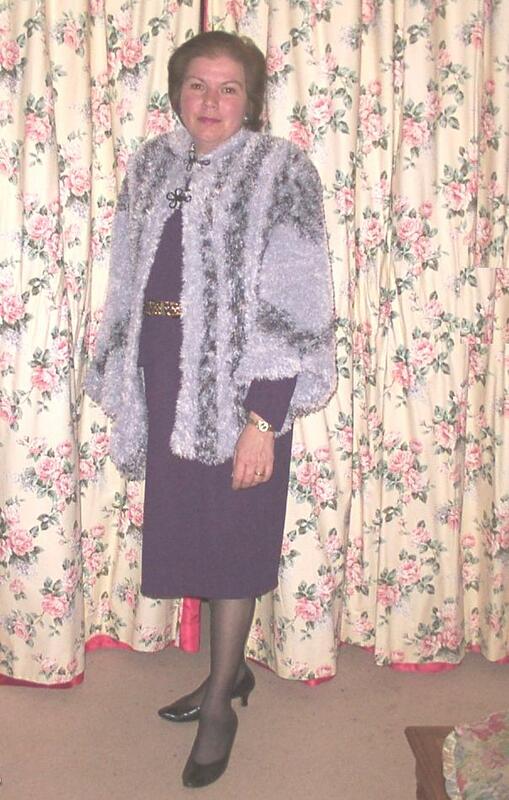 2001 The Faux Blue Fox Fur Coat! This garment was made from Heirloom "Mink" in a design from Interweave Knits called "Racoon Jacket". 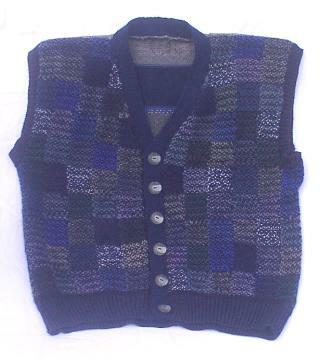 2001 This waistcoat is from Sally Melville's "Styles" and is called "The Whistler Vest". It is made with Cleckheaton Machine Wash 8 ply as the main colour and numerous other contrasts in similar weights with a few mohair squares for variety. I made this garment in one piece to the armholes. It was very quick and satisfying to knit. The photo below shows my love of colour. Chris and I are wearing variations of Kaffe Fassett's "Tumbling Blocks" and Victoria is wearing "Outlined Star". 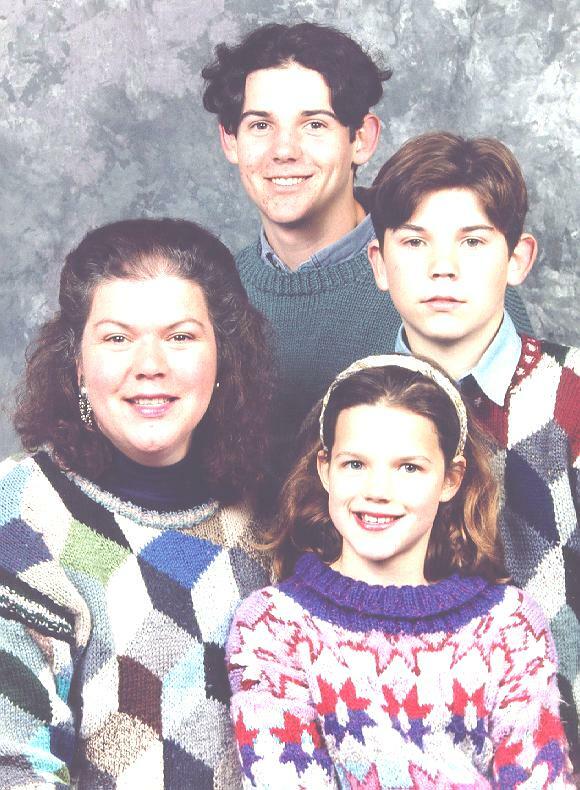 Alex's jumper is plain. The yarn for Alex's jumper was bought especially for that project. The other jumpers were assembled from my stash, built up from leftovers from other projects, yarn bought at sales and op shops and bartered with friends. My yarn stash has easily doubled since then. I remember knitting most of the body of Victoria's jumper on the long flight from Melbourne to Los Angeles, back in those glorious days of being able to knit on planes. I was absorbed in the knitting, so I didn't notice the people walking past. My son told me that people were actually coming to look at what I was doing, and more than once! Victoria's jumper is in mohair, and the yarn used for the outline has lurex threads so the stars twinkle.